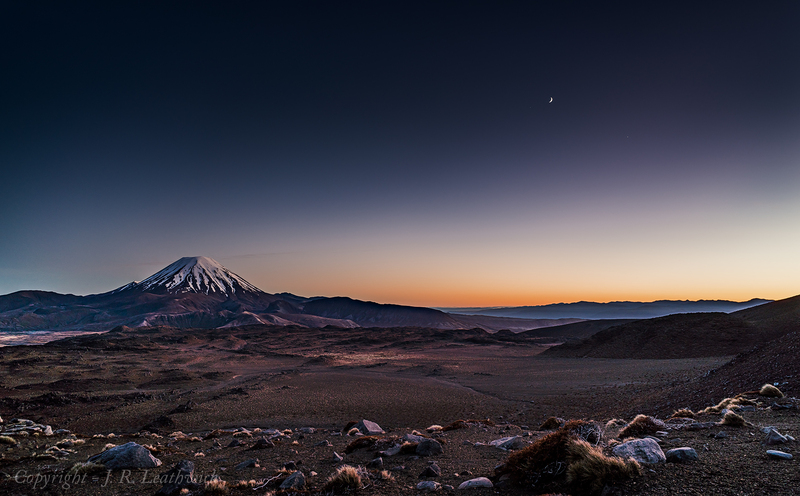 I took this image of Ngauruhoe from a campsite on a ledge on the northern slopes of Ruapehu. I had set my alarm for 5.30 am in expectation of good conditions for photographing the sunrise, but had forgotten that a crescent moon would rise at 3 am that morning. As soon as I peeped out the tent door, I grabbed my camera, threw it on the tripod, and took this image as the first light of day coloured the eastern horizon. Saddle Cone can just be made out to the far right, with the Kaimanawa Mountains forming the skyline behind it.